A beautiful expanse of land of Lombardy, a short walk from Brescia, Bergamo and from Europe. Interesting sightseeing to discover through the hilly landscape, the wine, both white and red, that made it famous around the world. Paths, old trails, to be discovered by bike itineraries through vineyards, meadows and woods of the most secret Franciacorta, are now available to everyone. A bike ride immersed in the enduring quietness, breathe the air infused with the scents of the countryside, surprised by the simplicity of the rural churches or amazed at the splendor of the Abbey, feeling transported across history, from the walls of ancient castles or walls of pebbles and portals stone is no longer fantasy. Viniculture in Franciacorta has ancient origins, like the passion of the local farmers for the care of their vineyards. Many winery offer guided tours of their old cellars and offer the chance to taste and directly buy the wine produced, such as the Franciacorta Brut, Pas Dosè, white and red of Franciacorta. In Capriolo the winery Ricci Curbastro, as well as allowing visits to their cellars, has created an agricultural museum that collects, in three large rooms, a large number of objects (4000) used in the past by rural households for cultivation of fields and for everyday life (free admission opening hours 9-12 / 15-18 weekdays). 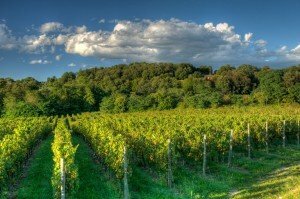 Throughout the year is possible, even for tourists without their own vehicle, to explore an area that has much to offer and live sensations and emotion, spending a few hours or whole days between recreation and relaxation with interesting destinations and, why not, dedicated stops with tasty food and wine.